From a 1982 Journal dispatch on the Chicago education reform pioneer. Mrs. Collins’s school was two years old in 1977 when a Chicago Sun-Times reporter, Zay N. Smith, invited essays on Shakespeare from suburban high school students. The results were hilariously ignorant. “The Global Theater was a three-sided octagon,” one wrote, Mr. Smith reported. Mrs. Collins saw that story and invited Mr. Smith to Westside Prep in the “allegedly fetid ghetto,” as she put it, where the kids actually read Shakespeare. “What I found,” says Mr. Smith, “was a remarkable little school with a rare and remarkable teacher.” The media steamroller took off from there. 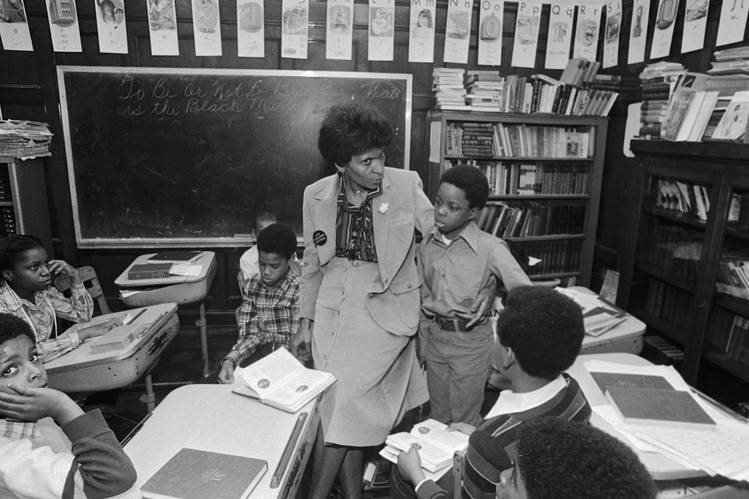 In the next four years, dozens of publications praised Westside Prep and Mrs. Collins. . . .
Another critic, Chicago Tribune columnist Vernon Jarrett, was incensed by Mrs. Collins’s appearance in an April 1980 ad in The Wall Street Journal. In the ad, paid for by SmithKline Corp., Mrs. Collins endorsed publicly funded tuition vouchers that would be paid to parents, who could then spend them on any school. “I saw her playing into the hands of the right wing,” Mr. Jarrett told a Chicago weekly. In truth, though, they also saw her as a powerful rebuke to the failure of this city’s public schools, especially those in black neighborhoods. Gang violence is rampant at many of those schools. . . . As for achievement, the average eighth grade student in the Chicago public schools lags by about a year-and-a-half the national average in reading comprehension, math and language skills. Even Mr. Jarrett, the Tribune columnist, seems to recognize this failure. He says he sent his two sons, now adults, to parochial schools to avoid gang pressures. . . .
[Mrs. Collins’s critics] know that her success showed that poor black children can learn outside the public schools—with little money and without the bureaucracy.